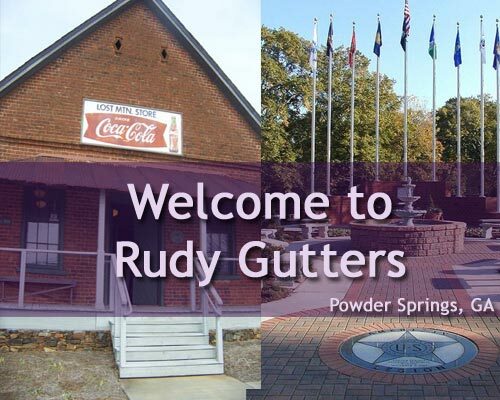 Welcome to Rudy Gutters, we are a professional gutter installation company located in Austell, GA. My name is Rudy Garcia and I am the owner, we are a family run and operated business, if you allow us to come and give you an estimate you will find out that our company is very affordable and will do right by you, if you need help or have any questions do not hesitate to contact us. We have been servicing the Powder Springs, Lost Mountain and West Marietta areas and the rest of Cobb county, we offer seamless residential gutters (5" and 6" 0.27 or 0.32 Gauge) and can service all of your gutter needs. We service the following zip codes: In Powder Springs, GA we will service 30127 and the surrounding areas of Marietta, GA 30064, if you need an estimate and you live in either zip code 30127 or 30064 please call us, we can definitely come out and give you a free, no obligation estimate. Rudy Gutters believes that your new gutter system should do its job but also enhance the look of your home. We have installed in the past several years gutter covers in the Marietta and Powder Springs areas that have made the home of our customers stand out from the crowd.